At Blue Moon we are constantly impressed by the design innovation of our clients. Not only do we take careful note of popular items and buying trends but we are also interested in the final use of the furniture and accessories. One such interesting tale of design innovation was from our new friend in the Southern States, Phil. Phil is lucky to have a big family with lots of children and grandchildren. In order to ensure lots of face time with his family he decided to transform his home and yard into a retreat for his family. In order to do so he added a custom designed pool, pirate ship play structure for the children and a beautiful waterfall using the jagged slate and rocks unearthed while digging out the pool. Like any good resort the next step was obvious: SEATING. Like a true design innovator he recognized the beauty and practicality of the Lychee Wood Dining tables so created an outdoor floor plan surrounding the pool area including an expansive balcony. He used a series of Lychee Wood Dining Tables in varying sizes and designs, some slices of wood and others cut lengthwise to anchor the space. 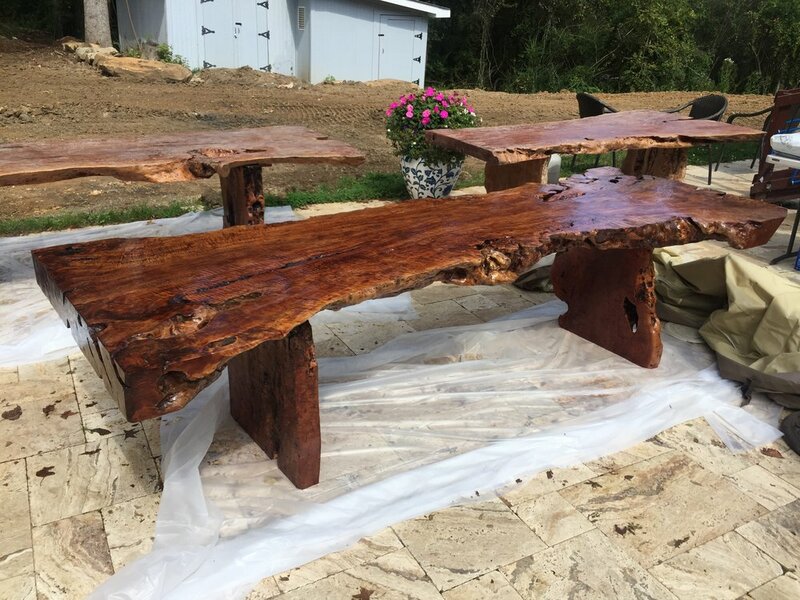 Next we collaborated with Phil and his family to create custom made outdoor teak arm chairs to coordinate with the tables and space. Now, not only is Phil's place the hub of his family, he is also hosting neighbourhood BBQs and other events. It seems to be the case of "if you build it they will come". Having built a beautiful, fun and functional space to host so many people he is now constantly finding new excuses to expand his social circle. Not only that but he is now the envy of his friends who are all lining up to create their only Lychee Wood retreats. And for that we are thrilled to help!! !